There isn’t a single thing in the world that can’t be made gayer by adding the words “on ice” at the end. And that goes doubly for an anti-Chick-fil-A protest. 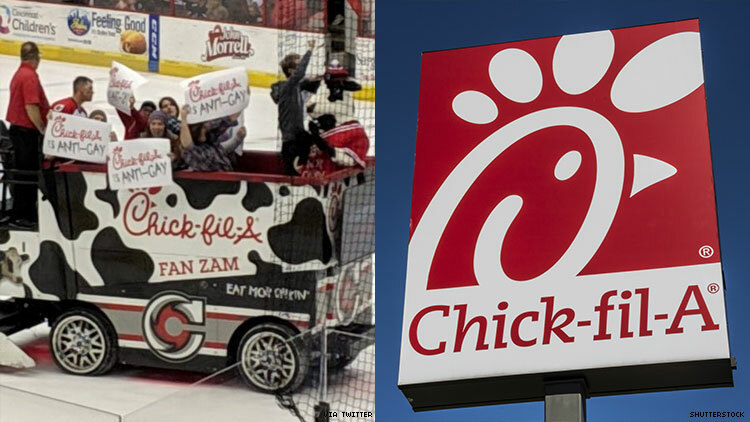 The Cyclones’ account also said the protesters were removed from the arena and apologized to those who were offended by the anti-Chick-fil-A signs. Cincinnati city councilman Chris Seelbach slammed the Cyclones on Sunday for what he deemed as a hypocritical move. In March, tax filings from 2017 showed that Chick-fil-A gave $1.8 million to three groups with anti-LGBTQ+ policies, even after the company had said that it would stay out of politics and focus on chicken. The company also does not have a nondiscrimination policy for employees based on sexual orientation or gender identity.